Oil trains cross the North Dakota plains. In Trump’s America, requiring flammable, oil-toting trains employ better braking systems apparently isn’t worth it. On Monday, the Department of Transportation’s Pipeline and Hazardous Materials Safety Administration rolled back an Obama-era rule that was meant to improve the brake systems on “High Hazard Flammable Unit Trains” aka “bomb trains” as some environmentalists call them. These oil-carrying trains have the potential to spill their contents into waterways or even burst into flames in worst-case scenarios. 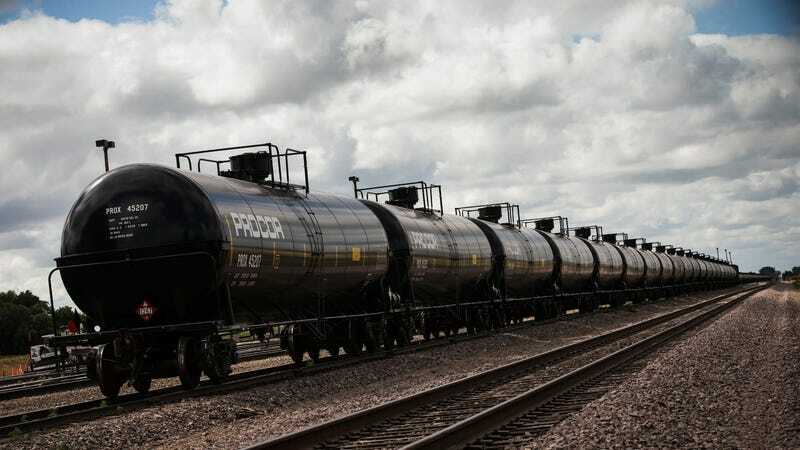 More than 250,000 barrels of oil a day move via rail, as of June 2018, per the U.S. Energy Information Administration. This move doesn’t come as a surprise. The Department of Transportation announced back in December plans to do away with the new regulations mandating Electronically Controlled Pneumatic (ECP) brakes for certain trains. These brakes are supposed to be more reliable and faster than the current standard, but a recent governmental analysis found that the costs outweigh the benefits. Implementing this new technology is set to cost industry between $427.3 million and $554.8 million, while it’s expected to produce $257.5 million to $374 million in benefits. However, these regulations didn’t come out of thin air, said Barry Rabe, a public policy professor at the Gerald R. Ford School of Public Policy at the University of Michigan. Former President Barack Obama’s administration began to revisit oil train safety after a series of train wrecks, spills, and accidents in 2013. The Lac-Mégantic rail disaster in Quebec, Canada, was the most notorious: 47 people died after a train transporting crude oil from the Bakken Formation in North Dakota derailed and exploded in downtown Lac-Mégantic. Part of the issue there was the train’s brakes. But it seems that disaster wasn’t enough to scare the current administration into implementing better controls on these trains—even though a projected increase in U.S. oil production will likely force companies to rely on them even more, Rabe told Earther. Still, this move is in line with the deregulatory frenzy sweeping the federal government. The Department of Transportation is only the latest to choose industry’s bottom line over people and the environment.